Trail shared by Michael Klasmeier with improvements by Conrad S.
Family Friendly Great beginner trail for kids and adults. The first natural surface singletrack in Anne Arundel County, this initial 2.5 miles of trail is ready to ride. This trail system is twisty and fun with no rocks and only a few roots. Due to the lack of obstacles, this is a great family friendly, beginner friendly, route. Since the trails were hand-built by experienced trail builders, this area has been optimized for riding fun. Currently, parking is available on Hawkins Rd on the shoulder, as there isn't an official parking lot yet. Phase 2 begins March 2016 with the addition of 5 miles of trails. This trail was built with support from AACo, Scenic Rivers Land Trust, MORE, MET, TrailWerks Cyclery,and Family Bike Shop. Major donors include Specialized Bicycle Company, Quality Bicycle Products, SRLT, Family Bike Shop, TrailWerks Cyclery, SC Logic, and Family Vet Clinic. 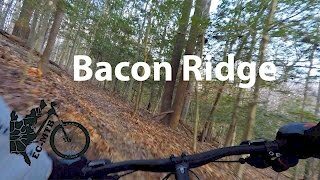 Great flow, perfect for a quick lunch or after work ride! first bike ride with chris and second one on the stumpy !! beautiful day out! The trail is nice and dry but there are a lot of leaves on the trail. It was my first time here. There will be a lot of wet leaves on it with rain. Another fun feature on Bacon Ridge Phase 1.